So, this would be my last instalment of my San Francisco visit in early 2014. After having an interesting day at The Walt Disney Family Museum the day before, it was my last day in SF. My flight was in the afternoon, so me and my husband decided to visit touristy sites in the morning. First, we headed to the famous red bridge in the world a.k.a The Golden Gate Bridge. The bridge connects San Francisco Peninsula to Marin County. It held the record of the longest suspension bridge in the world until 1964. 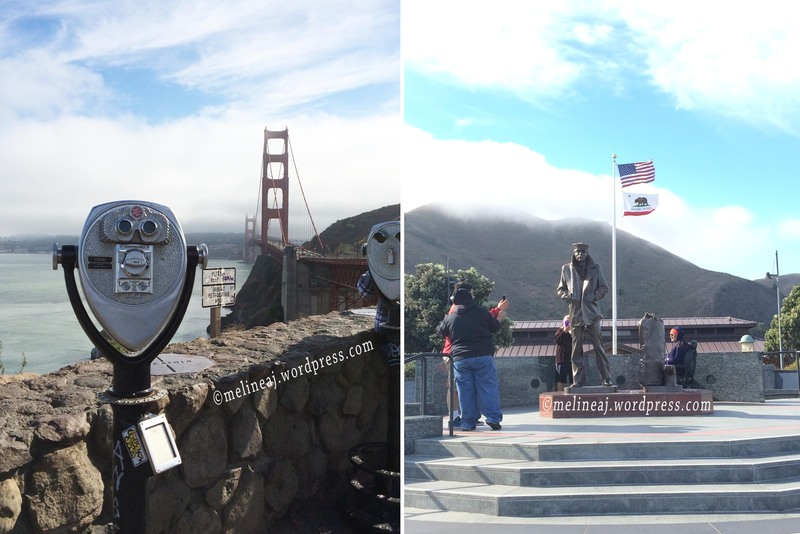 There are 2 viewing points near the area: Golden Gate Bridge Pavilion on the south side – SF Peninsula (click here for the map) and Vista Point on the north side – Marin County (click here for the map). Both viewing sites have very limited parking spots (Vista Point has more spots but it is usually crowded with tourists’ cars), so be real patient to wait for someone to go out. Another option is using public transport to go here. The official Golden Gate website has direction for the public transit options. On this trip, me and my husband went to the Golden Gate Pavilion. We visited this very site 7 years ago, so we wanted to have a nostalgic walk around the site. A little touch up had been done around the site. There is a gift shop that wasn’t there before. The bicycle and jogging paths were under construction 7 years ago. 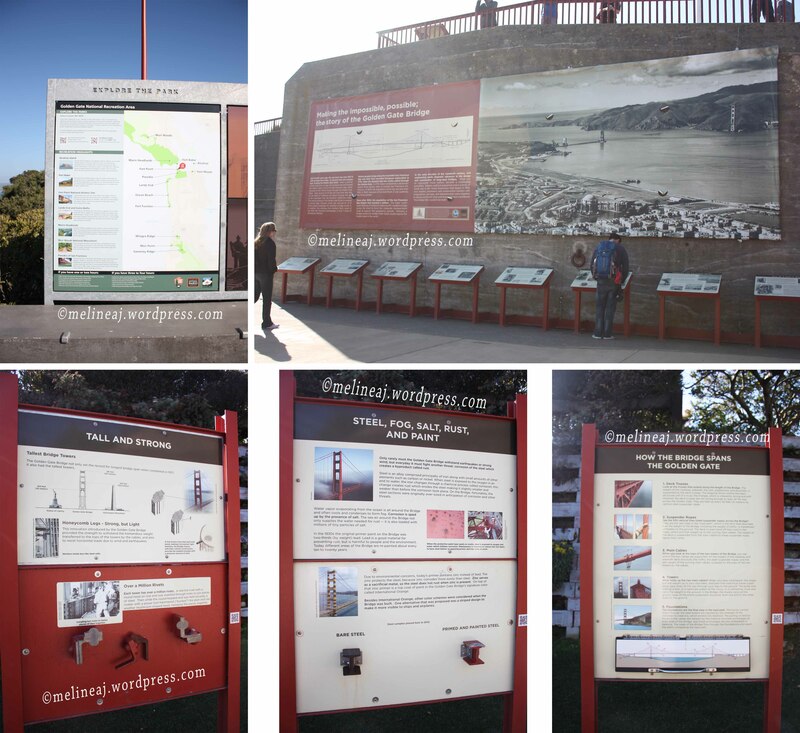 There are big posters explaining the history and construction of the bridge. I won’t bore you into details on those ones hehehe… In fact, you can read here for all the informations about the bridge. We walked on the bridge to take some pictures. At the lower path, you’ll be able to see the big steels foundation of the bridge closest to the land. IMO, this viewing site has the more beautiful shot of the bridge itself. You’ll be able to capture the whole bridge in a great angle. While Vista Point offers you a picturesque shot of San Francisco downtown and a bit of the Golden Gate Bridge on the right. I had a chance to visit Vista Point last October when my brother in-law came to visit us. See the picture for comparison. Ghirardelli Square is located to the west of Fisherman Wharf. This was the original site of Ghirardelli’s Chocolate Factory up ’til 1960s. Ghirardelli Chocolate Company was founded by an Italian immigrant, Domingo Ghirardelli in 1852 (ref). It is the 2nd oldest chocolate company in the USA (ref). The main attraction here is the Original Ghirardelli Ice Cream & Chocolate Shop that serves various types of ice cream and sundae drizzled with decadent Ghirardelli chocolate. *I’m craving for one now! drooolll…* Don’t forget to visit the more spacious shop around the corner and you might get a free Ghirardelli square. Nyum…. Around the shops, there are many small and local shops and restaurants. After sharing a delicious bowl of sundae, we walked toward Hyde and Beach Streets to take some pictures of the famous San Francisco cable car. Note: the line up for this cable car ride was very long! Most of them are tourists who wants to experience riding the cable car. We then walked toward Hyde Street Pier. The pier is part of San Francisco Maritime National Historical Park. There are some historic ships anchored to the pier. Some of the ships are available for paid-tour. We decided to just sit on one of the benches on the pier and enjoyed the sun. From here, we headed to SFO International Airport and sadly, I had to say a temporary goodbye to my hubby 😥 Anyhow, I did enjoy my short visit to San Francisco. Don’t worry I have the another the San Francisco post after this. My 4th SF post was from a week long visit on October. Stay tuned!